M.A.R.S. curator Shana Nys Dambrot takes us on a journey of provocation, intrigue, fascination and conceptual novelty. M.A.R.S. Test Site Salons brings forth art programming that reflects an aesthetic approach in visual corollary to the musical spirit of the festival — one that is expressive of fast-paced and futuristic realities, while remaining tethered to shared, direct experience and place-making attentions. A curated group of multimedia, installation and performance artists, as well as artists using new technologies within the bounds of conventional art-making, will create exhibition and site-specific sculptural installations for the duration of the festival. These artists as well as experimental musical and special performance art guests will be invited to occupy and activate these spaces in a nightly series of salon-style cross-platform events throughout the week. 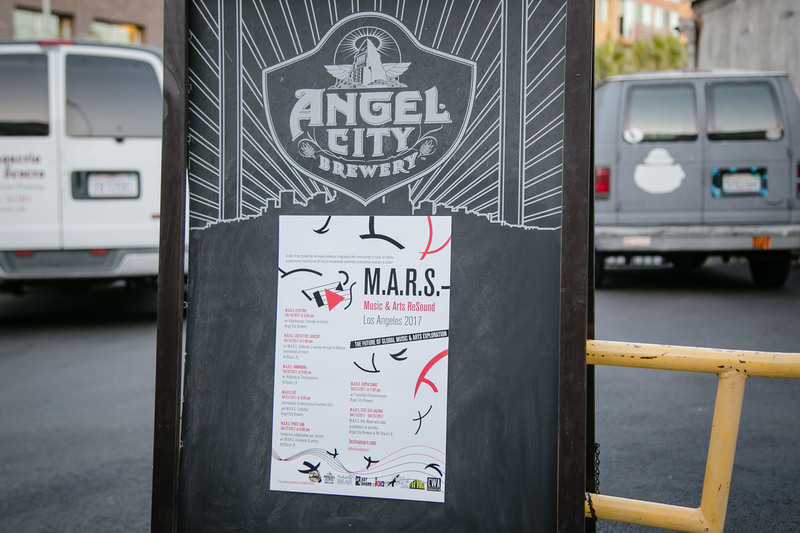 Venue: Angel City Brewery & Art Share L.A. The M.A.R.S. Test Site Salons are a part of the 10-day festival’s Arts Week program, featuring daily installations and activities curated by Art Critic Shana Nys Dambrot. On view daily throughout the festival and being unveiled at M.A.R.S.’ opening night party is a new painting and an augmented reality (AR) exhibition by visual artist Daniel Leighton; a sculptural installation by cardboard artists Dosshaus; and a photography installation and performance work by Amy Kaps. Plus, opening night will feature an appearance by futuristic human-interface performance artist Tiffany Trenda. The gallery will feature a sprawling dimensional, interactive, and kinetic art installation throughout the first floor. Art Share-LA’s two project rooms will house performances — one by Amy Kaps, the other, a collaboration between performance artist Victor Wilde and video artist Jesse Gilbert — that will unfold inside a pair of site-specific immersive installation environments. Visual artists Bryan Jacobs, Jay Mark Johnson, and Thomas Sturm w/ Samantha Calvetti will install significant works in open spaces throughout the first floor. Throughout the week, Art Share’s Perimeter Gallery will feature a group show of walls works by all visual, performance and video artists on the MARS lineup, culminating in the MARS Artist Reception & Miscreants Film Premiere on Saturday 22nd. Additionally, throughout the week, video artists Kio Griffith, Kristine Schomaker, Artist, Jennifer Vanderpool, Pearl C Hsiung, Osceola Refetoff, and Ned & Shiva Productions will each screen one-hour programs in daily rotations, projected on the large wall in the open lobby. Ensemble Pamplemousse‘s new video album This Is The Uplifting Part will also be looping in the hallway leading up to the classrooms. Follow M.A.R.S. on Facebook for updates and sneak peeks on our artists and individual projects.